Why do we aerify greens? It's happened to all of us golfers, we arrive at a golf course only to find out the greens have been recently aerified. It's an immediate punch to gut. (pun intended) It is however, important to understand WHY we must go through the process of punching holes and laying sand on the greens. 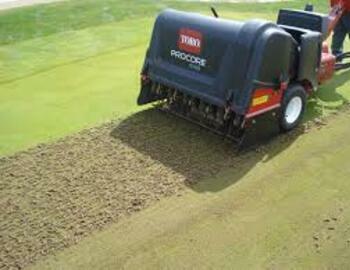 Aerification achieves three important objectives according to the Golf Course Superintendents Association of America. To put it in simple terms, grass roots need oxygen to survive especially when you have a low cut grass. Aerification is a necessary practice and improves the longevity of the greens, without aerification the greens would eventually die.